Last week, I was working on a client's time sheet file, and noticed something strange. The worksheet was used to record shift start and end times, and I was testing the calculations, to make sure that everything was working correctly. Shifts that run past midnight can cause problems, so I tested that scenario, and I also tested shifts that started at midnight. I wanted to be sure that everyone would get all the pay they were entitled to! The calculations were working well, but the cells where I had entered a midnight time appeared empty. Fortunately, the calculations still worked, even with the missing start times. I know that midnight is a favourite time for mysterious things to happen in horror movies, but was my worksheet haunted? Was this an early Halloween prank? I turned the Show Zeros setting back on, and all the midnight times came out of hiding. In Excel 2010, click the File tab, then click Options. 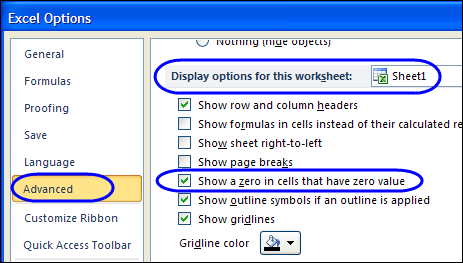 In the Advanced category, scroll down and in the Display options for this worksheet, add a check mark to "Show a zero in cells that have zero value"
I had forgotten all about this problem, until someone left a comment on my blog yesterday, asking why the midnight times weren't showing in her worksheet. At least I'm not the only one who has had this mysterious problem, and if it has happened to you, I hope this tip helps. That's one of those settings I forget about, but I often use the custom format "0;-0;" or something similar to hide zeros. It causes the same problem, so thanks in advance for hair-loss prevention. This solved one of my problems in my time sheet. 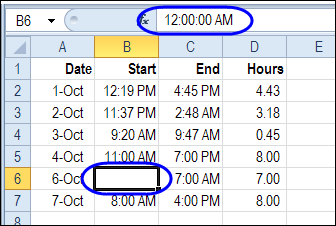 But, when someone isn't working, the total hours column shows "24.00". How do I get it to show "0.00"?